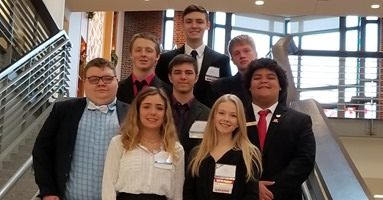 On March 14 and 15, 2019, Celina High School Future Business Leaders of America (FBLA) members attended the State Leadership Conference at the Ohio State University Student Union in Columbus. Over 460 students from across Ohio were represented at the conference where students attended workshops and competed in business related contests. Celina students placed in the top 10 in 16 competitive events. Those students who placed in the top three in an event qualify to compete at the FBLA National Conference, June 29-July 2, in San Antonio, TX. Accounting 1 Mason Heller – 4th in Political Science Kobey Simpson – 5th in Financial Math, 9th in Accounting 1, and 9th in Introduction to Business Lauren Higgins – 7th in Accounting 1 FBLA advisers are Carol Bader and Christina Sutter.